This Comforter is Super comfy! Stay warm and cozy with this all--season comforter, which is filled with a plush down blend for your supreme comfort. Its baffle box construction keeps the filling evenly dispersed so that your body temperature stays regulated throughout the night. The smooth, breathable 100 percent cotton cover has a 250 thread count, which makes for a soft, durable fabric. Use this comforter all year long as it is suitable for all temperatures. It comes in a solid white, which is neutral enough to mesh with most color schemes and patterns. If properly cared for, this comforter maintains its crisp, clean look, even with extended use. This comforter is like sleeping in a cloud. It took a couple of days to fluff up as down comforters will, but is very soft and really comfortable. Received it in about a week and it didn't smell funny or anything like that. The material isn't very soft, it's almost a canvas feel, but if you have it in a duvet cover, it's just fine and feels very durable.I'm always cold and this comforter keeps me nice and warm at night, but seems to be on the warm side for my husband, who's always hot. I look forward to having this for a long time to come. The thread count makes this the perfect weight and softness. This is the second one I have had exactly like it. They wash well. I use it in the summer and winter. Great product! Great product. High thread count of cover keeps down inside, stitching keeps down evenly distributed. Fluffs up nicely after unpacking. Just the right weight for cool nights. I am VERY satisfied with my purchase from Overstock. This down filled comforter is just right for my husband and me. I've had other down comforters and they have been way too hot, and too thick. This one is just right. 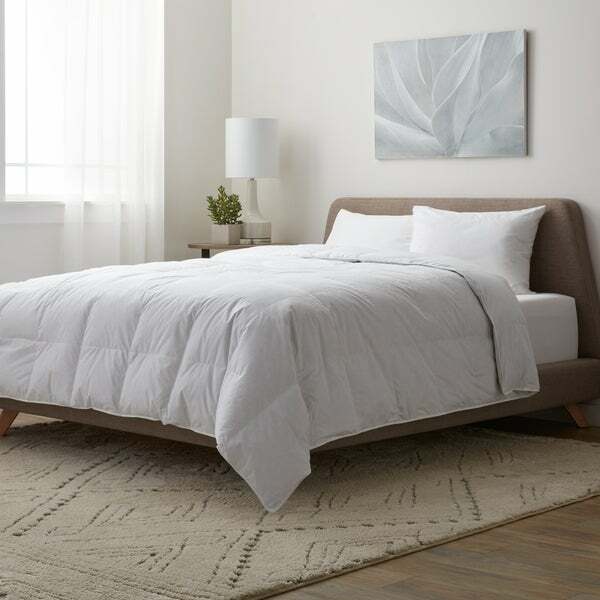 We live in Oregon where it is seldom freezing, so this light weight comforter is ideal. It also breathes, being all cotton covering, and I like that a lot. Another great thing about this one: the down feathers stay put. They don't work their way out of the fabric and onto the bed. (I've had others that do and it's a mess) Great product, especially for the money. 5 stars for this item. My friend has a down comforter and I loved it so much that I decided to buy one of my own. After looking at all the different options, I chose this one because it has a 600 fill power. This was the perfect choice. It's cool enough to sleep under during 80 degree weather, but kept me warm when the temperature dropped to 35-40 degrees right after I got it. Overall I'm extremely happy with this purchase. It's a great value for the price. This is what a was looking for. The color and the quality were very well described. This comforter is on the thin side when you first take it out of the package. However, I opted to purchase a King for my Queen size bed and it is perfect! Long where it needs to be and it doesn't feel thin.. Nice and cool for the summer months and fluffs up some once it's rested on the bed for a day or two... The feathers do not come out, I've seen maybe one(could also have been fuzz :) Overall this is a really great down comforter. I own a heavier one that feels a bit thicker, but this down comforter seems like it will last a long time. The all seasons down comforter is exactly what I was looking for: not too heavy; not too light. The construction keeps the down settled in the squares, so little fluffing is necessary. The fabric is a true white, so goes perfectly into the white on white duvet cover I have.We have slept comfortably every night we've used it and look forward to years of use. Thank you for such a good product. Needs more fill to be all season. This is more like a lightweight throw. This comforter worked well in the duvet. It is not super heavy, but dense enough to fill the duvet and make it fluff. Overall, we are pleased with this purchase and will buy again if needed. I ordered this "COMFORTER" because of the description and picture. I just opened the box to wrap the gift for my brother for christmas and its barely a blanket. I thought it was vacuum sealed because the box was smaller. Its no thicker than a bedspread. Its going back. NOT AS PICTURED! Misleading!!! this down comforter is missing but a couple feathers of down in many of the squares in the middle, where the majority of the insulation is needed. i didn't feel like returning it so we're using it for my daughter, but I would never buy it again and would not recommend it to anyone else. i may fold it in half and sew it in place to make a toddler down comforter -- then it may have enough insulation to keep a small body warm. I have been using the comforter for a couple of weeks inside a duvet cover and love it. It is just the right weight - not too heavy, not too light. Great purchase! I have washed this many times and it looks great! Very happy with this purchase. Would purchase again. Bought two of these for my kids’ (ages 12 and 10 ) bedrooms. Wasn’t looking for an expensive comforter, since chances are they’ll do something to it and I’ll have to replace. It is on the thin side, but definitely warm enough. Would definitely buy again. I love this comforter. Keeps me toasty in the winter but light enough to use year round. This is my second one. After years of use, the first one needed to be replaced. Exactly what I wanted for Florida nights. Lightweight. Bought this for my daughter.....washes well and looks beautiful. Bought her the full size and now I am ordering the king size they are both in white. I can’t wait till this comforter is delivered as I am going to use it at my Florida “snowbird” home! Love it! Bought as for a replacement for same one i bought years ago! I love this duvet. It is the perfect weight for all seasons! I wash and dry my duvets and this one has stood up well. It is a good price and a decent quality product. It's soft and year round warmth. I am satisfied with the price I paid for, like most purchases with Overstock; this website is solid and has good stuff. I bought this for my husband, who doesn't need very warm comforter, and he likes it so far. It is light and is moderately warm for chilly nights. I think it should do a good job for winter nights in NY if the room heater is kept on. Good value for the price. Blanket was not too heavy but not thin either. I bought this comforter for my guest room. Every time someone stays in that room, they comment on how soft and comfortable the comforter is. My friend went home and ordered one for herself! This comforter is like sleeping in a cloud! So warm and luxurious. Used it all winter and it kept us warm. My husband said we need another one in case something happens to this one. "Why does it list "Down Alternative" under Specs (Fill Type - Down, Down Alternative, Feather) when under Details it states that "Plush filling contains 50 percent down, 30 percent down and feather fiber and 20 percent feather" Is down and feather fiber a down alternative? If so, why?" "What is the fill power?" Hello Jennifer, the Twin is 18 ounce, Queen is 25 and the King is 29 ounce fill. Thank you for shopping with us. Whomever answered this question for Overstock previously did so incorrectly. They don't understand the difference between fill power and fill weight. A higher quality down will have a higher power rating with less weight. I needed the product and the price was right. "Does this comforter have corner/anchor loops for a duvet cover?" Hi cijego, This does not feature duvet cover loops. Thank you for shopping with us.